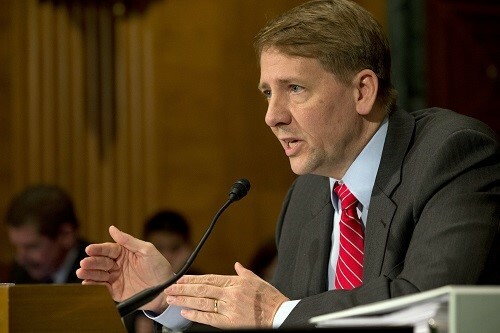 In the continuing fight over the future of the Consumer Financial Protection Bureau, House Republicans are taking the offensive against Democratic efforts to preserve the agency and its controversial director, Richard Cordray. In a blog posted to Medium, the Republican-led House Financial Services Committee claimed that Democrats themselves had inadvertently made a case for firing Cordray. Under current law, the president can remove the CFPB director “for cause” – in essence, Cordray can be fired only if it can be demonstrated that he’s neglected his duty or abused his power. Republicans argue that Cordray has done just that under Section 1071 of the Dodd-Frank Act, which requires financial institutions to collect and report information on credit applications made by small businesses and businesses owned by women and minorities. The purpose of the regulation is to “facilitate enforcement of fair lending laws.” It also states that the CFPB “shall prescribe such rules, and issue such guidance as may be necessary to carry out, enforce, and compile data” required by the regulation. According to the post, Cordray has been derelict in making those rules – a dereliction Democrats have noticed. “On July 8, 2015, Ranking Member Waters and twelve other Democrat members of the House Committee on Financial Services wrote him to urge the CFPB to ‘start the rulemaking process immediately to implement Section 1071,’” the committee wrote. The blog post also noted that Cordray himself admitted that enforcing the regulation was “a mandatory job Congress gave us” in 2013 testimony before the Senate Banking Committee. The post cited numerous additional examples of Democrats urging Cordray to implement Section 1071. To date, that implementation hasn’t occurred. And that, Republicans claim, constitutes dereliction of duty – the “cause” necessary to legally fire Cordray.